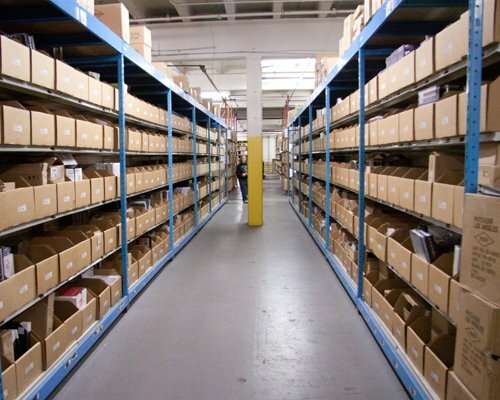 As a leading order fulfillment company for ecommerce sellers, we’re often asked to describe how our fulfillment center works, the types of products that we handle, as well as the types of orders and shipments that we handle. Below you’ll find a brief overview of what a fulfillment center is, along with information on how we operate and some of the pros and cons of using an outsourced distribution partner. To get more of a visual of our company and how we operate, you can also jump over to our homepage to take a tour of our fulfillment center. A fulfillment center is defined as a warehouse that picks, packs, and ships orders to customers. The type and size of the orders may vary significantly, as can the type of customer that is receiving the order. In addition to outbound shipping, many fulfillment centers also handle the steps involved with processing returned orders. There are multiple types of order fulfillment centers (FCs). Some FCs only handle ecommerce orders that are shipping direct to consumer (D2C). This type of fulfillment is commonly referred to as “eFulfillment.” Other fulfillment centers only handle larger, business-to-business (B2B) orders that ship to commercial locations. And there are other FCs that handle both. While we have “eFulfillment” in our name, we actually handle both D2C and B2B orders here at eFulfillment Service. All of our clients have an ecommerce component to their business, meaning they sell online via their own web store and/or via Amazon, eBay, Walmart, or some other marketplace. In addition, many of our clients also have a B2B side to their business, for which we are shipping case packs, cartons, and/or pallets to their B2B customers, which may be small retail boutiques, or large “big box” retailers. Beyond these two categories of eFulfillment vs. B2B, there are also niches within those niches. For instance, some eFulfillment centers only handle smaller products and parcels. Others deal primarily with larger products. There are others that will only work with sellers that stock a low number of products or SKUs. And there are some that specialize in particular types of products, such as apparel or supplements. A warehouse and a fulfillment center are not always the same. Many warehouses are strictly used to store goods and do not actually handle any shipping. A fulfillment center, on the other hand, may store your goods; however, they will also require that your business does, in fact, ship orders, meaning that you cannot use their warehouse strictly for storage purposes. At eFulfillment Service, we are a fulfillment center, not a storage warehouse, although we do provide more flexibility than many other FCs because we do not force our clients to meet minimum order volume thresholds. While our clients all sell their products online, some of them are in startup mode and have low order volumes to begin with. At some point, for any business that requires shipping, they are going to have to make the decision about whether or not they want to handle the shipping themselves, or outsource to a third-party fulfillment company, like eFulfillment Service. By outsourcing your order fulfillment, your company will likely have time to focus on what you do best, which may be product sourcing, marketing, and/or strategic planning. If you handle it internally, even if you have qualified warehouse supervisors, the fulfillment operation will ultimately eat up time of upper management when they could be focused on other things. Handling your order fulfillment in house will come with fixed overhead costs, such as warehouse rent, equipment, and indirect labor. As your order volume goes up and down, your cost per order may also go up and down with these fixed costs. By outsourcing your order fulfillment, as long as your fulfillment center doesn’t have minimums or charge a high monthly retainer, merchants are typically able to experience more of a variable cost model. For many online sellers, the shipping rates they pay on their own may be higher than those they would pay by outsourcing their order fulfillment. One reason for this is that the fulfillment company is able to negotiate better rates with the shipping carriers. Another reason is that the company may have multiple warehouses, and if the merchant has the order volume and product that justifies splitting their inventory, they would be able to lower their shipping rates by warehousing closer to their customers. Several aspects of any ecommerce operation may ebb and flow, including sales, restocks, returned orders, etc. This can make it challenging to cost-effectively manage your fulfillment staff in house while maintaining fast, consistent turnaround times in all areas. By outsourcing, you pass these headaches on to your fulfillment company. Because this is their specialty, many distribution centers are able to manage these ebbs and flows more effectively, all while maintaining rapid turnaround times and a more predictable cost per order for you, the seller. As your operation grows, warehouse space may become an issue. This is also something you shouldn’t have to worry about with a fulfillment partner, although it is a good idea to confirm their total capacity and their ability to expand that capacity over time. Some ecommerce business owners have difficulty giving up the control of their fulfillment operation, and knowing that it’s just steps away from their office. Ultimately, it requires that you trust your fulfillment partner, that you’ve done your due diligence to ensure it’s a reputable, financially-stable company, and knowing that all of your demands may not be met. It’s not uncommon for merchants to want to add some type of customization or personalization to the fulfillment process, whether it’s using a branded shipping box, custom packing materials, or even a personalized letter. When you outsource, you may have to sacrifice some of this customization, which may ultimately be a good thing if it lowers your costs and you’re able to pass those savings onto your customers. As I stated above, some sellers are able to lower their costs by using an outsourced fulfillment center. In other cases, depending on the seller’s volume and requirements, their total costs may actually go up. Overall, however, this may still be advantageous for their business because they’ve put themselves in a better position to grow by improving the level of service to the customer, improving their scalability, reducing errors, and by freeing up their time to focus on their core capabilities. In this article, we discuss what a fulfillment center is, and overview the pros and cons of outsourcing your order fulfillment vs. handling it internally.